Type – Hard coded with “Payment”. Date – Date for the payment. 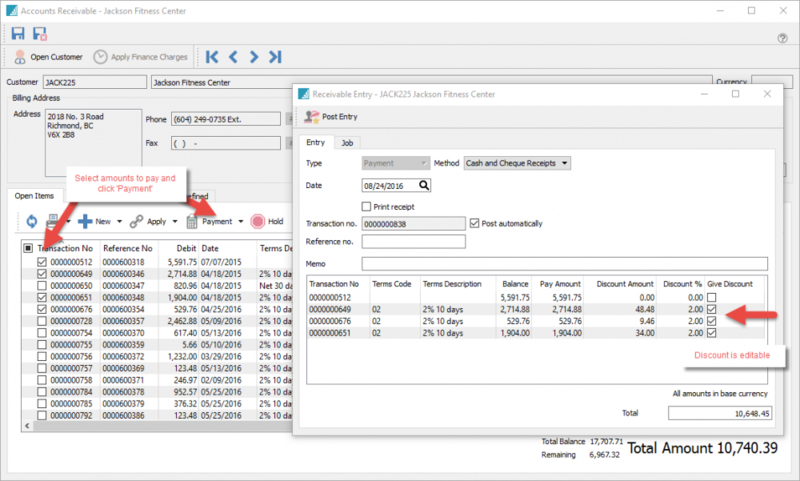 Transaction – The assumed GL transaction number. If another transaction is posted after this number is assigned, then the transaction will be given the next available number. Reference – Usually the customers check number or if paid by credit card the user can enter Mastercard or Visa. Memo – A memo can be added for this payment. Pay Amount – User can override this and the invoice will get partially paid have the payment linked to the amount. Discount Amount – The discount amount. This is calculated by the terms but can be edited before posting. Discount % – The discount % being offered. Give Discount – Check to give the discount. Amounts that fall within terms will automatically be checked but user can override. Total – The amount being paid. It is the sum of the transactions selected for payment.